The V-label, or European vegetarian label, is a unique quality label which the European Vegetarian Union has awarded for 30 years to products made in accordance with vegetarian and vegan ethics, or services which are performed in accordance with the same. Its primary goal is to enable consumers to easily recognize products without animal based ingredients, as well as places where they can consume such products. The V-label has become the most recognizable and most common vegetarian symbol worldwide, which is supported by the fact that the V-label was introduced by many internationally known companies, such as DM, SPAR, Tartex and others. The V-label is intended for vegetarians, vegans, those suffering from allergies and anyone who wants to eat healthier and pay attention to the ingredients of the products they buy every day. V-label licensees offer a proven and controlled product which instills confidence and is accessible to everyone. 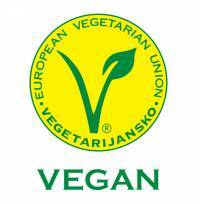 Animal Friends Croatia, as a member of the European Vegetarian Union, is a representative of the V-label in Croatia. Suplement – Under the PlanT brand they offer products intended primarily to support women during pregnancy, after childbirth, during breastfeeding and products for the care and health of babies and children. Annapurna – In its offer, Annapurna has a wide range of products made from soy and wheat, without animal based ingredients. Vegetariana – Their offer contains spreads made from tomatoes, mushrooms and truffles. Omegol – Under the Omegol brand they offer vegan mayonnaise. Cherry Blossom Bed and Breakfast – A hotel and restaurant in Istria with an exclusive vegetarian offer. Oleum Maris – Extra virgin olive oil from Vodnjan. Clavis Consultor - Their veggie burgers in granulate is new and unique on Croatian market. Brist - Extra virgin olive oil from Vodnjan. Sana delikatese - have on offer hummus with various extra flavours and vegetables. For more information on the V-label for manufacturers/authorized dealers click here. For more information on the V-label for restaurants/caterers click here. For more information on the V-label for consumers click here. More information is available at www.v-label.info.